This is a very convenient product which is entirely natural and it could also help you maintain well-balanced hormonal levels. At the same time, it might help you handle PMS symptoms and ensure an overly relaxed menopause period. It is natural and it doesn’t contain any chemicals. The product is made by a company called Nature’s Way. This is one of the best known manufacturers on the market and it is definitely going to provide the necessary credibility. With hundreds of products on the market, it has the necessary experience and it is amongst the most convenient and well-known influences in the field. Black Cohosh Root Ingredients – Are they Safe & Effective? Black Cohosh Root Extract – This is the only ingredient found in the product. It’s great for balancing your hormones and for enhancing your overall health condition during menopause. 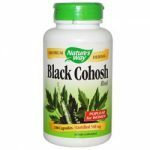 How Does Black Cohosh Root Work? The supplement essentially works by addressing the low estrogen in women which cause severe PMS and menopause symptoms. Black cohosh root has been found to offer estrogenic activity which makes up for the estrogen deficiency in the body thus easing the different PMS or menopause symptoms naturally. There are some studies indicating that black cohosh is almost as effective as hormone replacement therapy (HRT). Take 1 capsule three times daily or as recommended by a health care professional. Take it with food in order to reduce the chance of side effects. Follow intake with a glass of water. What are the Advantages of Black Cohosh Root? What are the Disadvantages of Black Cohosh Root? It isn’t offered with a money back guarantee. There are many ambiguous feedbacks. Consult your health care provider before intake if you are taking any medication or have any medical condition. Do not take this product if you are pregnant or nursing. Make sure to read and follow the recommended intake carefully to prevent side effects. In the case of any severe side effect, discontinue intake and consult your health care, provider. 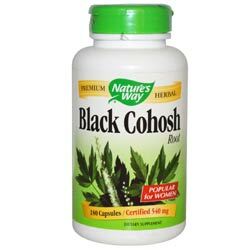 What Kind of Reviews are Out there for Black Cohosh Root? The product does seem to resonate fairly well within the community, having received plenty of positive reviews. It’s also important to note, though, that it’s not all glamour. There are quite a few negative ones as well, which is to be expected. For instance, some people report that they’ve felt fairly awkward after using the product. Another one, however, says that he has been using the product for a very long time and that it has always managed to work perfectly. If you are looking for something which might be able to help you out throughout menopause, this is something to have a look at. The product might be able to have certain benefit effects and it’s entirely harmless as well. The ingredients included in it are harmless and there is no added sugar, which is always something that you want to be looking forward to. However, this is one of the broadest fields and there is a ton of competition. This is why we suggest that you take a good look at the market and make sure that you’ve picked the bet one.